California braces for flooding as warmer weather bears down: New study suggests continued warming could sap the state’s snowpack by 2100. 2017 has been ‘an extremely good year in terms of snowpack’ … but inevitable coming California snowmelt may dampen fond memories of much-needed precipitation. It’s been more than a month since Los Angeles Mayor Eric Garcetti declared a state of emergency for seven days. At the time, he was alarmed at the prospect of snowmelt in the Eastern Sierra flooding the Owens Valley and damaging the Los Angeles Aqueduct. That aqueduct is the city’s lifeline that brings fresh water from the Owens River in the Eastern Sierra Nevada to LA more than 200 miles away. The flood hasn’t yet come, but back in March Garcetti had reason to worry. When he issued his emergency declaration, March had been unseasonably warm in the Eastern Sierra. High temperatures at Lone Pine in the Owens Valley, at the foot of Mount Whitney, had been hovering in the mid-80s for seven of the previous 12 days – far above the seasonal average of 70 degrees (Temperatures in April were also high, with 18 days of high temperatures above the historical average. In the first week of May, temperatures were in the mid- to high-80s). 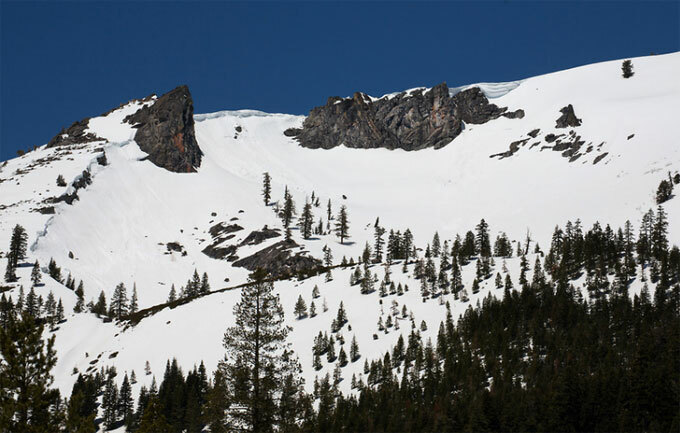 On May 1, Sierra snowpack was 196 percent of the historical average for that date, with a snow water equivalent of 42.5 inches, the California Department of Water Resources reported. It’s only a matter of time before creeks and rivers swell. With persistently hot temperatures like those in March, April and the beginning of May, watersheds below the Eastern Sierra could quickly become overwhelmed – and infrastructure associated with the Los Angeles Aqueduct threatened. California is a notoriously dry state, despite the record winter storms earlier this year. It simply doesn’t rain on the West Coast like it does in many other parts of the nation. As a result, mountain snowpack has historically served as the state’s natural reservoir, and the water it holds has been relied on to flow down creeks and rivers and into man-made reservoirs and aqueducts beginning in April. Sierra Nevada snowpack provides California with 60 percent of the state’s water. With a healthy winter snowpack, those flows typically continue through September – when times are good. The state is coming out of one of the biggest winters in decades. But if it gets too hot, too fast, and for too long, water managers will have no choice but to release melt water from reservoirs and send it toward the coast and back into the ocean. That seems like a big problem for California. But a new study suggests an even bigger one in coming decades: the Sierra snowpack itself is dwindling, much faster than previously realized. In their study, published March 9 in Geophysical Research Letters, Hall and his colleague Neil Berg of RAND Corporation found human-induced warming diminished snowpack in the Sierra by 25 percent more during the 2011-2015 drought than it otherwise would have been. Below 8,000 feet, human-driven climate change had even worse consequences: it diminished snowpack by up to 43 percent. In their study, Berg and Hall combined computer modeling of the atmosphere above the Sierra, snow, and topography; they compared those simulations with observational data from satellites and on-the-ground measurements of the water content in snowpack. They also ran simulations of snowpack prior to the Industrial Era, to see how much anthropogenic warming currently is causing the loss of snow. Projecting snowpack loss into the future, the researchers found that more dramatic changes are coming. Under a “business-as-usual” scenario – that is, if carbon emissions globally continue to rise unabated – average temperatures in the Sierra are projected to increase by as much as 10 degrees Fahrenheit. The consequence for mountain snowpack overall: it’ll fall by 85 percent. “There would be almost no snow at altitudes below 8,000 feet,” according to the UCLA summary. While the loss in total snowpack is expected to fall by 85 percent, snowpack losses would be less dramatic above 8,000 feet, where “high altitude terrain is cold enough to stay ‘in the freezer’ even as average temperatures rise,” Hall wrote in the e-mail exchange. The study by Hall and Berg suggests that warming already built into the climate system will impact Sierra snowpack far into the future. For example, even if the Paris climate agreement survives its shaky position with the Trump administration on the world stage – the Administration has hinted it may soon pull the U.S. out of the accord – the amount of Sierra snowpack during a future drought similar to what California had experienced well into 2015 could still fall by 60 percent by 2100, Hall and Berg found. 1. Consistently incorporate information on future climate change impacts into water resources infrastructure planning. 2. Double down on water conservation. 3. In the cities and communities that depend on Sierra water – that is, most of the state – emphasize local storm water capture, infiltration, and storage. California clearly faces challenges particular to the state, but much of the American West faces drier, warmer weather, and the entire region will struggle in coming years to ensure that there’s enough water where and when it’s needed.